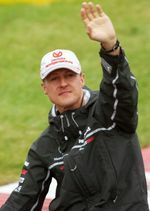 Michael Schumacher, the Greatest Grand Prix Driver! Michael Schumacher, the Greatest Grand Prix Driver, bid farewell to Grand Prix Circuit on this Sunday, 25 November at the Brazil Grand Prix at the age of 43 years! It was great to watch a smiling Michael passing the baton over to Sebastian Vettel, 'Schumi Junior', but a bit sad to see Michael go, as F1 wouldn't be the same without him! Sebastian Vettel grew up watching Michael winning the World titles and now he has won three World Titles in a row, the youngest to do so! Michael, the 'Seven times' World Champion, finished 'Seventh' in his last race at the Brazilian Grand Prix and he also came 'Seventh' in his first Grand Prix in Belgium 308 races ago, in 1991! Michael Schumacher was majestic in a Formula One car , and his name was synonym to 'Ferrari' for many years, and people think of him no different even after he changed team! Michael's grand odyssey started at the Belgian Grand Prix in 1991 and ended today at the Brazilian Grand Prix, winning 91 races, the first in 1991 Belgian GP and the last being the Chinese GP in 2006! He has won the World Championships seven times, 1994, 1995, and five times successively, in 2000, 2001,2002, 2003 and 2004! He has raced in 308 GP races, collecting 1566 points and 155 Podium positions during his charismatic career!. He raced with 'Benetton' during 1991-1995 and then with 'Ferrari' during 1996-2006, retired from racing and stayed with Ferrari as the Consultant, and made a come back to racing with 'Mercedes' in 2010 till his decision to retire today at the Brazilian GP. Michael Schumacher was like a magnet, drawing people to watch the Grand prix and I hope that he will return to GP wearing another cap in a different capacity, as his presence will make a difference to the rainy days of GP days! I still treasure the 'Thank you letter' from him while he was recovering from an accident during the British GP few years ago! Grand Prix racing wouldn't be the same without Michael, as his brilliance, competitive spirit and extreme driving skills are invincible! According to the official Formula One website, he is "Statistically the greatest driver the sport has ever seen". And I am sure all his fans, the world over, echo the same and bid him farewell with tears in their eyes! Michael Schumacher was like a magnet, drawing people to watch the Grand prix and I hope that he will return to GP wearing another cap in a different capacity, as his presence will make a difference to the rainy days of GP days! I wish him the very best in all his future projects! MIchael, you are the best, and will always be!